Alternative Perspectives | Home Composting: Reduce, Reuse and Recycle! Home Composting: Reduce, Reuse and Recycle! Rapid urbanisation and increasing population are adding to the woes of waste management in Delhi, as the capital city produces tonnes of waste every day. Waste managers are struggling with waste disposal, management of ‘mixed waste’ and transformational costs. Kitchen waste accounts for 50 per centage of household waste in the country. As per National Institute of Urban Affairs (New Delhi) an average Delhiite produces at least 50 grams of kitchen waste in a day. 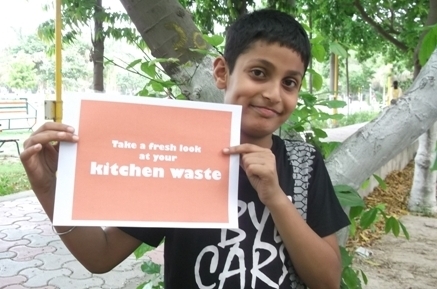 Thus, the city produces at least about 870 TPD (tonnes per day) of kitchen waste, which comes under biodegradable waste . The municipality door to door garbage collection service is not properly operated and benefits only 15% of the population. Moreover, there has been a failure to segregate non-recyclable waste from recyclable waste. When kitchen waste is disposed off in landfills, it releases methane, a relatively damaging greenhouse gas and leachate, a toxin capable of considerable soil and groundwater pollution. Delhi’s waste problem can be reduced, if people come together, take initiative and process biodegradable waste within their houses or socities. Development Alternatives (DA) in collaboration with the Delhi Government has piloted the initiative of ‘Decentralised Waste Management’ in E-block of Saraswati Vihar, Pitampura. The project is being supported by the Department of Environment, Government of National Capital Territory. 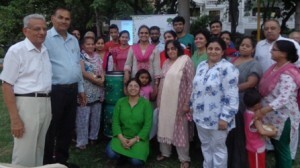 Development Alternatives is working to build capacities of residents, implement decentralised waste management practice and build public perspectives for advocating ‘Zero Waste’ concept through home composting. Composting is an inexpensive, natural process of recycling decomposed organic waste (mainly kitchen and garden waste) into a valuable soil known as ‘manure’. Home composting is easy to make, turns organic waste such as food scraps and yard trimming; good for soil conditioning. Waste source reduction through composting is one of the successful methods of reducing waste generation. Residents’ capacities are being built to manage bio-degradable waste (mainly kitchen waste) in a decentralised manner, by the CLEAN-India team of Development Alternatives, along with the support of RWA. As part of this project, household waste care composters are being installed at households to convert the kitchen waste into organic manure. 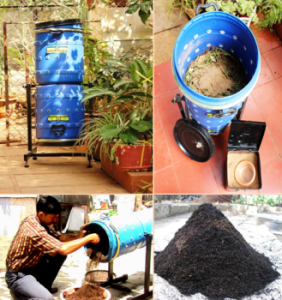 ‘Waste Care Composter’ is a composting machine, which converts all kinds of organic waste into compost within the building/premises and solves waste management problems completely. It takes all the cooked and uncooked food waste including dairy products, vegetables and fruit peels and leftover food and converts them into nutritious manure. These composters are light, hygienic, pest-free, noiseless, rat proof and easy to use pits. Residents are being trained to convert their kitchen waste into manure through waste care composters, without any composing agents such as earthworms. By this technology, a family can recycle all its kitchen waste and generate about 10-15 kgs of compost in one month. The CLEAN-India team is in the phase of awareness and has already identified 45 House Holds to begin with home composting. A sense of realisation is being developed amongst children, women and men that they have a responsibilty towards the planet earth and the onus lies on them to create a world, which is greener, sustainable and healthier. The CLEAN-India team has adopted the 4A’s approach, which signifies environmental Assessment, Awareness, Action and Advocacy (4’A’s) and will ultimately mobilise society for environmental impact. An assessment survey was carried out in the society to understand the waste scenario of the locality. Awareness sessions have been conducted in the locality to make people understand the need and importance of waste management and ways through which they can recycle their waste at household level. Mediums like Door to door awareness and community meetings were used to interact with the resident of E-Block, Saraswati Vihar. The view expressed in the article are those of the author’s and not necessarily those of Development Alternatives.